Sundaram Tagore Singapore is pleased to present new large-scale color photographs from Salt Pans, the latest installment in Edward Burtynsky’s ongoing series of photographs exploring different industrialized landscapes around the world. We are delighted to welcome the artist to Singapore for the exhibition preview. For this project, Burtynsky traveled to Gujarat, India, to photograph the Little Rann of Kutch, a region that is home to more than 100,000 salt workers extracting around one million tons of salt from the floodwaters of the Arabian Sea each year. The works on view were shot from a helicopter during an intense ten-day period. The striking geometric images present the pans, wells and vehicle tracks as abstract, painterly patterns: subtly colored rectangles crossed by grids of gestural lines. In recent years, Burtynsky’s photographs have become increasingly abstract as a result of his topographical perspective and fascination with finding similarities to painting in the industrialized landscape. However, the reality behind these disarmingly beautiful images is a harsh one. Each year thousands of poorly paid Agariya workers toil in the pans to extract large quantities of salt from the floodwaters. Furthermore, receding groundwater levels, combined with debt, diminishing market values as well as a lack of governmental support, threaten the future of this 400-year-old tradition and the lives dependent on it. With these stunning images, Burtynsky skillfully captures the delicate balance between natural and human processes—the presence of salt in the earth’s composition and our need to harness it. The photographs in this show were recently published in a book titled Edward Burtynsky: Salt Pans by the German publishing house Steidl. Work from this series will be on display alongside a select group of images from another new book Edward Burtynsky: Essential Elements, which examines the artist's work across four decades. 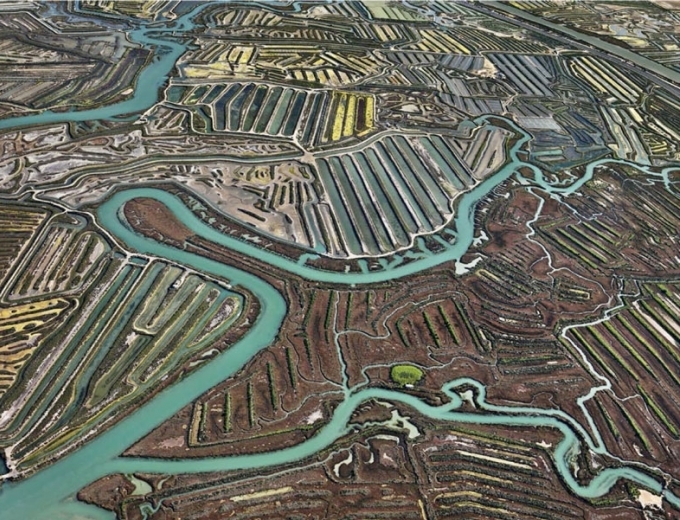 Edward Burtynsky (b. 1955) is a Canadian photographer. His photographs have been published in project-based monographs, featured in award-winning documentary films and seen widely in international touring exhibitions. His previous publications include Water (2013), Oil (2009), Quarries (2007) and China (2005), all published by Steidl, and Manufactured Landscapes (2003), published by the National Gallery of Canada in association with Yale University Press. He is the recipient of many awards, including the TED Prize, the Outreach Award at Les Rencontres d’Arles, the Roloff Beny Book Award and the Rogers Best Canadian Film Award.